For the first time in many years, my sister and I attended the Original Sewing and Quilt Expo in Minneapolis. It was essentially a social event to catch up with old sewing friends. Oops, ‘old’ is not an appropriate term although must admit we are all older–and better for it! The best term is ‘long-standing’ friends. The one mission I had was a zipper for a garment in the planning and found two that will work. One from Vogue Fabrics in Chicago and the other from Ghee’s. 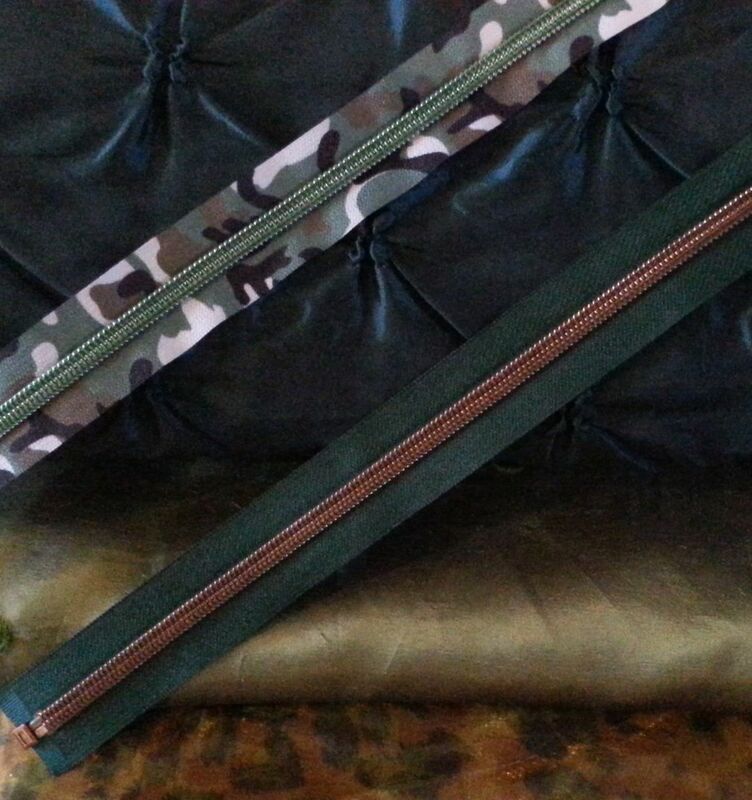 Zip Choices: Camo tape would need to be inserted whereas green tape could be applied on top of garment. It was a successful friend reunion–and made some new ones too. All in all, a pretty inexpensive shopping trip–until the very end. Here was a booth of irons, strategically situated where you practically walked into it. The man in charge was clearly a State Fair hawker, in the best of all possible ways. We had fun with him until his counterpart returned from lunch and got into her spiel. Then we were hooked as she knew ironing. The husband standing next to us quickly bought one (he does his own ironing) before even asking the price. Sidebar here: Why are men never concerned about price? 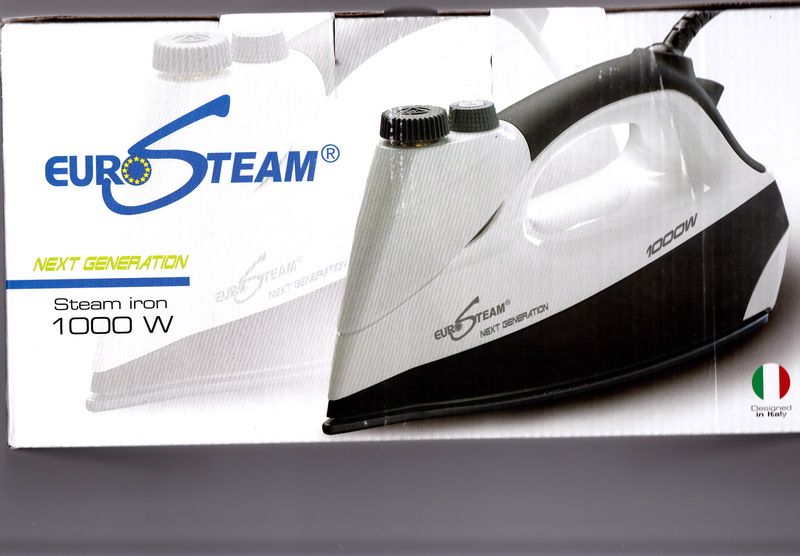 Sis and I were next in line as we immediately recognized the advantages and quality of this pressurized iron. I have used the gamut of home and professional irons. Home irons are not heavy enough nor do they produce enough steam for sewing projects, and they invariably ‘spit’, leaving ugly water spots. Professional, gravity feed irons are great but you need to hang a water container from the ceiling (that’s why it’s called gravity feed). It takes up space, I always seem to get tangled up in the water tube, and climbing up and down to refill the water container is an issue. 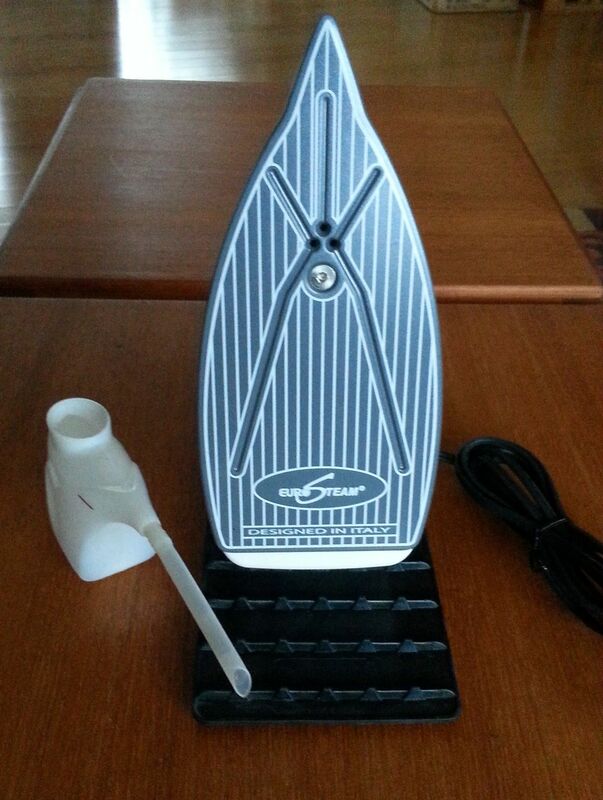 Many years ago, I discovered a Pfaff Steam Generator iron similar to the picture. Apparently Pfaff is not making these irons so link is to a similar Rowenta iron. Unfortunately, after nearly 20 years, it died and parts were unavailable. I wasn’t enamored with the water tube connecting the iron to the tabletop tank, although the tank was certainly more convenient, so didn’t purchase a new model. Have been using Walmart home irons and chucking when they start to spit. And this has worked as haven’t been doing any tailoring which requires copious steam. 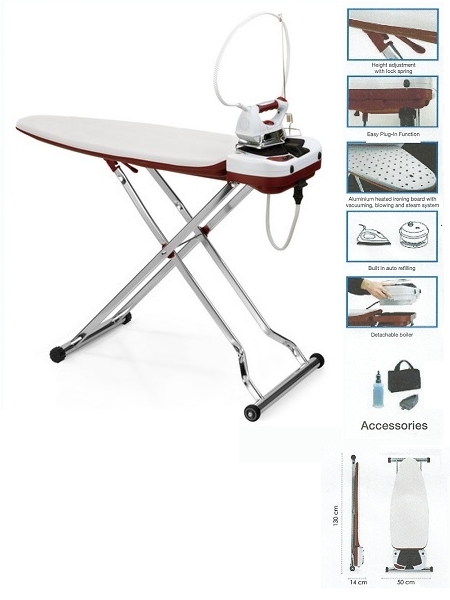 By the way, do have the Integrated Ironing Board (see above) with a vacuum and blower. Plan to put it to good use when I get to my Chanel-style jacket. 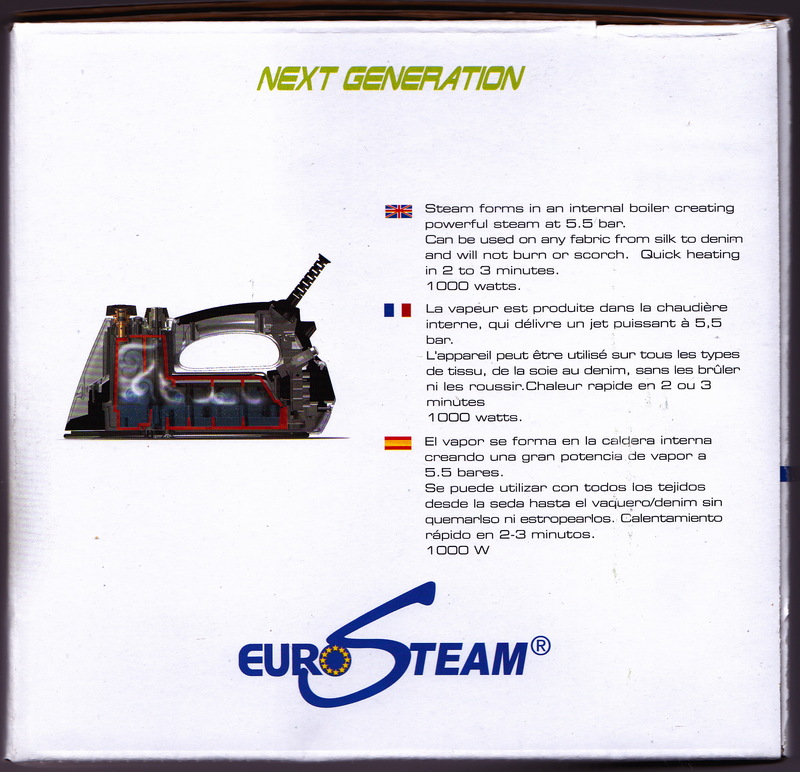 And this is where the Eurosteam comes in–for the making of that Chanel-style jacket. Now, haven’t had a chance to do a test run but based on the demo at the Expo and product manual, this will be a terrific, all-purpose iron. Use it, Love, Love, Love it!! 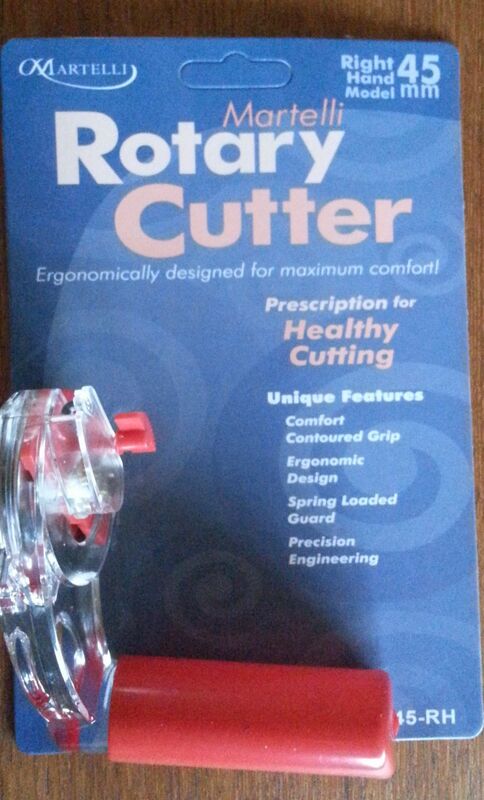 The other item I purchased is an ergonomic rotary cutter, designed for right- or left-hand. I don’t have hand issues(yet) but was attracted to the cutter’s ability to cut many layers at once. Believe it may be the answer to cutting thick polar fleece. Another plus is that it uses Fiskar blades which are locally available. Don’t you hate it when you run out of blades in the middle, or even the beginning, of a project! Notice the hand position and the fact that the guard opens automatically. PS: This product was hawked by the distributor, Martelli, and they are more suited to a Fair than a sewing expo. However, they were much fun and you can always get better deals when you start to walk away. Then they go into overdrive with the, “Woe is me; got to meet a sales quota.” Maybe they do and maybe they don’t; it’s great entertainment. Remember: the tool and it’s quality will go far in helping the sewist achieve professional results. 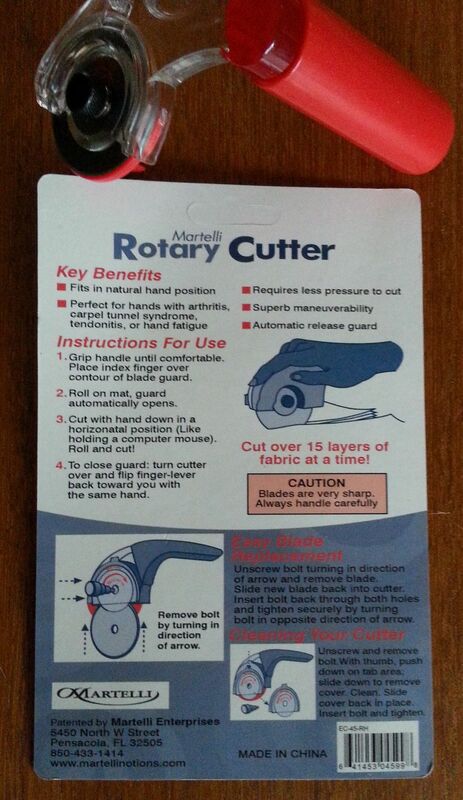 This entry was posted in FIBER FASHION FUN, GREAT IDEA and tagged eurosteam, pressurized.ergonomic rotary cutter, zippers. Bookmark the permalink.